1. Mix the dried fruits with 2 tbsp Brandy and leave to soak overnight. 2. Cream butter, sugar and salt until creamy. Add vanilla essence and lightly beaten eggs. 3. Fold in sifted flour and mixed dried fruits and mix well. 4. Using a spoon, scoop about a teaspoon of the cookie dough and drop it into the crushed cornflakes. Roll into small balls and place them on baking tray lined with parchment paper. 5. Bake in preheated oven at about 160 deg for about 15 to 20 minutes or until lightly brown. 1. Clean dried prawns and remove grits. Place in a blender and grind till fine. 2. Fry chilli paste, buah keras and belachan with a little oil till aromatic. 3. Add ground dried prawns and keep on frying till crispy. Remove and add in 5 tbsp sugar and the sliced limau perut leaves and mix well. 4. Place some prawn mixture on a piece of poh piah skin, roll up and seal with egg white. 5. Deep fry till golden brown. Drain on absorbent paper and when cool, store in an air-tight container. 2. Beat butter with sugar,egg, baking powder, salt, pepper powder and chilli powder. 3. Add in cheese and sunflower seeds. 4. Fold in sifted flour and mix well into a dough. 5. Roll dough out and cut into desired shapes. 6. Polish cookies with egg and bake in preheated oven at 170 deg C for about 20 mins or until lightly brown. 1. Sift plain flour with 1/4 tsp salt. 2. In a mixing bowl, mix flour with icing sugar and ground peanuts. Add in peanut oil bit by bit and work till dough can be rolled into a ball without cracking. Shape into marble-sized balls. 3. 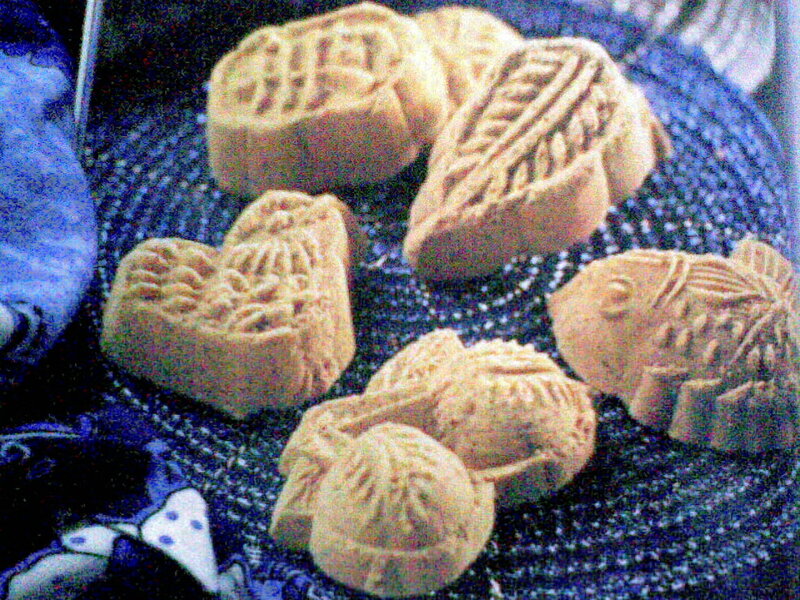 Place cookies on a greased and floured baking sheet. Glaze with beaten egg and decorate with half a peanut in the centre. 4. Bake in a preheated oven at 170 deg C till golden brown. Remove tray from oven and leave to cool slightly before removing cookies from baking sheet. 1. In a dry wok, stir-fry the green beans flour and pandan leaves on low heat till fragrant. 2. Sift the flour and remove the pandan leaves. Leave to cool. 3. Mix flour and icing sugar in a big mixing bowl. Sprinkle with water, a little at a time and carefully mix with the flour mixture. (Do not add too much water or the mixture will be very sticky). Mixture should resemble fine breadcrumbs and should be able to hold its shape when pressed into a lump. 4. 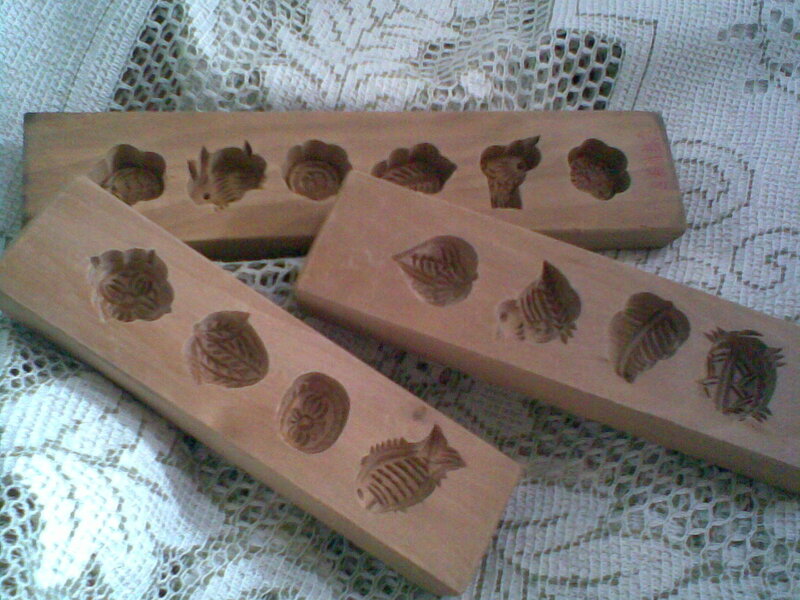 Fill a wooden kueh koya mould with a handful of crumbly bean mixture. Press mixture into moulds till firm and compact or the imprint will not be nice. Level and scrape off excess mixture with a scraper. 5. Dislodge biscuits by tapping the mould gently. Arrange on an ungreased tray and dry in the sun for a few days until firm and dry. Alternatively, bake in an oven at 120 deg C till dry. 1. Sift the self raising flour. 2. Cream butter with sugar till light. Add in the eggs, one at a time, stirring in one direction. 3. Fold in the sifted flour and dessicated coconut. Add in the vanilla essence and mix well. 4. Spoon batter in small heaps onto greased trays and and top each with a small piece of cut cherry. Bake cookies in a preheated oven at 150 deg C for about 20 minutes or till light brown in colour. 5. Cool cookies on a cake rack before storing in an airtight container. 1. Put butter in a saucepan and place over low heat until butter browns. Pour into a large bowl and cool until beginning to set. Stir in sugar and vanilla essence and beat well. 2. Sift flour with bicarbonate of soda and slowly add to the butter mixture, mixing until a smooth dough is formed. 3. Chill dough in fridge for 1 hour. Roll rounded teaspoonfuls of dough between palms of hands to shape into balls of about 2 cm in diameter. 4. Place on a lightly greased baking tray and bake in a moderate oven for 10-15 minutes. Cookies should be firm and light golden brown. Do not overbake cookies or they become very hard. 1. Sieve flour with milk powder. 2. Cream ghee with icing sugar till light and fluffy. 3. Fold in the flour gradually till a soft dough is formed. Leave dough aside for 30 minutes. 4. Roll out dough and cut out desired shapes and arrange on greased baking trays. 5. Bake in a preheated oven at 150 deg C for 25 minutes. 1. Sieve flour with cornflour, milk powder, bicarbonate of soda and baking powder. 2. Cream shortening with butter and sugar and salt till fluffy. Add in eggs and cream till smooth. 3. Fold in sifted flour (1) and mix well. Add in chopped walnuts and knead into a dough. 4. Divide dough into small portions . Shape into a ball and make an indentation in the centre of each cookie. Top with a piece of crushed walnut and brush with egg. 5. Bake in a preheated oven at 180 deg C for about 20 minutes. 1. Cream butter with icing sugar and salt until light and creamy. 2. Fold in sifted flour and mix well into a dough. 3. Roll dough out and cut out cookies with an oval flutted cookie cutter. Brush with beaten egg and top with half an almond. 4. Bake in preheated oven at 150 deg C for 15-20 minutes. 1. Cream butter and sugar until light and fluffy, add in egg yolk and lemon juice and mix well. 2. Fold in sifted flour and knead lightly into a dough. Wrap with wrapping film and leave to chill in the fridge for 30 minutes. 3. Roll the dough out to 2mm thickness and cut out designs with cookie cutters. Sprinkle top of cookies with some grated cheese. 4. Bake in preheated oven at 180 deg C for 10-15 minutes or until brown. 1. Sift flour with baking powder, bicarbonate of soda and spices. 2. Cream butter with sugar and honey until light and creamy. Add in the egg and cream till well mixed. 3. Fold in the sifted flour and knead into a dough. (If dough is crumbly, mix in a little milk to bind). 4. Roll dough into a long roll and cut into small even pieces. Roll each piece into a ball and flatten. Top with a small piece of crystallized ginger each and arrange well apart, on greased baking trays. 5. Bake in a preheated oven at 190 deg C for 15-20 minutes until cookies are evenly browned. 1. Sift flour with salt and bicarbonate of soda. 2. Cream butter with sugar till light and fluffy. Add in the egg and the vanilla essence. Continue creaming till light. 3. Fold in the sifted flour and chocolate chips and mix well. 4. Drop mixture in little mounds on greased baking trays. 5. Bake in preheated oven at 170 deg C for 12-15 minutes or until golden brown and firm to the touch. 1. Cream butter with icing sugar till light and fluffy. Add in egg and vanilla essence and mix well. Fold in sifted flour and stir well to form a soft dough. 2. Place dough between 2 sheets of plastic, roll it into a flat piece. Cut out cookies with a butterfly shaped cutter. Arrange cut out cookies on greased tray and glaze with beaten egg yolk. Press an almond strip in the centre of each cookie. 3. Bake in a preheated oven at 180deg C for 15-20 minutes. 1. Cream ghee with sugar and vanilla essence until light and creamy. 2. Fold in sifted flour and add in ground almonds. Mix to a soft dough and refrigerate dough for half an hour. 3. Place dough between two plastic sheets and roll out flat. Cut out designs with cookie cutters. Arrange on greased baking trays. Glaze cookies with beaten egg. 4. Bake in a preheated oven at 170 deg C for 15 minutes until lightly browned. 1. Cream butter with sugar, condensed milk, vanilla powder, egg yolks and soda mixture. (mix bicarbonate of soda with 1 tsp water). 2. Add sieved flour and chopped mixed mixed fruits and stir well. 3. Place 1/2 tsp of dough on greased trays about 1.5 cm apart. 4. Bake in a moderate oven at 180 deg C for about 25-30 minutes. 1. Cream butter with sugar, salt, pepper and chilli powder till light and creamy. Add in the grated cheese. 2. Fold in 3/4 amount of sieved flour first and adjust accordingly. 3. Roll dough into long rolls, polish with egg and top with lightly toasted sliced almonds. Cut into 2 cm lengths, polish with more egg and re-roll properly. 4. Bake in preheated oven at 175 deg C for 15 minutes or until brown. 1. Sieve flour with bicarbonate of soda and salt, then mix well with fine oats. 2. Cream butter with sugar till white and creamy. Add in vanilla essence and beaten eggs a little at a time. 4. Lightly mix with the sieved flour mixture, then roll out dough to 1/8″ thickness. Cut out dough with a 2″ round cutter. Cut a small hole at the centre of half the lot of dough. 5. Place on greased baking tray and bake in a preheated oven at 180 deg C for 20-25 minutes. 6. Place a little jam onto the centre of biscuits and cover with the other piece of biscuit with a hole in the centre. 1. Sieve plain flour with bicarbonate of soda and salt. 2. Cream butter with sugar till white and creamy, add lemon rind, lemon flavour and lemon juice. 3. Lightly mix with sieved flour. Place mixture into a piping bag fitted with a star nozzle. Pipe out mixture onto a greased baking tray and decorate with cut cherries. 4. Bake in a preheated oven at 200 deg C for 20-25 minutes. 1. Sift flour with baking powder. 2. Cream butter and sugar until light and creamy. Add egg yolks and the sifted flour and ground almonds and mix well. Mix in the chopped almonds. 3. Knead into a dough and roll it into a 2cm-diameter cylinder. Brush with egg wash and roll in granulated sugar. Wrap in cling flim and chill in the refrigerator until hard. 4. Cut the roll into 2cm lengths. Arrange the cut dough on a baking tray and bake in a preheated oven 180 deg C for 30 minutes. 5. Cool the shortbread in the tray for a minute before removing to a wire rack to cool completely before storing in airtight jars. 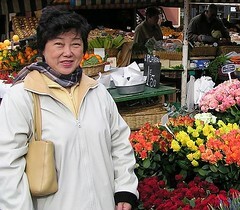 Please visit www.roseskitchenette.com if you want to print or email recipes. The recipes are exactly the same. I was unable to add the features on wordpress.com. Be notified by RSS everytime a new recipe is published!